Angela Merkel: "We have a lot of tasks ahead of us"
German Chancellor Angela Merkel has outlined plans to form a swift coalition with the Free Democrats (FDP) after a major win in Sunday's election. Mrs Merkel said the result was a great vote of trust, and that a government would be formed by 9 November. She said a coalition between the pro-business FDP and her centre-right CDU/CSU bloc would have the momentum to tackle Germany's challenges. Germany has been enduring its most severe recession since World War II. While business confidence has improved and Europe's largest economy has returned to growth, output is still set to be down by around 5% this year, and the country's unemployment level and budget deficit are rising. Mrs Merkel said she would hold "swift and decisive" talks with FDP leader Guido Westerwelle, emphasising that a new coalition would be in place at the latest by 9 November, when Germany marks 20 years since the fall of the Berlin Wall. "Of course quality comes before speed, but I think Germany is entitled to have a new government quickly," she said. "We have many tasks ahead of us." The two met for an hour in Berlin's chancellery on Monday afternoon, where an FDP spokesman described the mood as excellent. Mr Westerwelle has been tipped by some to be Germany's next foreign minister after his party achieved its best-ever election result, but he refused to be drawn on the details of his discussion with the chancellor. "We won't get big heads," he said. "We will work solidly. We will focus our work on what is best for our country and people." Although they would be the junior partners in a coalition, the FDP are likely to push for bold reforms and quick tax cuts to revive the economy, says the BBC's European affairs correspondent Oana Lungescu in Berlin. They will push for a total reduction of 35bn euros and a simplification of Germany's tax system. But with public debt soaring, the partners will find it hard to meet their tax-cut promises, our correspondent says. "The tasks for the future are very clear to see," said Mrs Merkel. "We need to have a clear mandate and clear responsibilities between the two parties." Mrs Merkel's previous coalition partners, the centre-left Social Democrats (SPD), suffered their worst election performance since WWII. With the CDU/CSU winning 33% of the vote and the Free Democrats (FDP) capturing 14.6%, according to preliminary official results, the two parties have enough seats to ensure a majority in parliament. The Social Democrat SPD won 23% of votes, while the Left party took 11.9% and the Greens 10.7%. Smiling broadly, Angela Merkel said her Christian Democratic bloc had received a vote of confidence to form a new government with the pro-business Free Democrats. Its priorities are combating unemployment and increasing economic growth to get the country out of the worst economic crisis since World War II. But with public debt soaring, the centre-right partners will find it hard to keep their campaign promise to cut taxes. In Germany, a parliamentary majority can be secured with the support of less than 50% if the parties in question have more support than the other leading parties combined. Financial markets and business leaders hailed Sunday's election result, but the ensuing coalition talks are likely to be tough, says our correspondent. 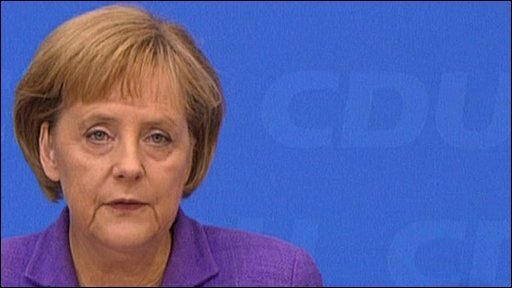 Mrs Merkel wants to focus on fighting unemployment, amid fears that Germany is heading for a winter of discontent. CDU Secretary General Ronald Pofalla said earlier his party was committed to implementing its election promise of tax cuts. "We want tax cuts in two steps in the next legislative period which will result in relief of 15bn euros (£13.8bn; $22.03 billion)," he said. Sunday's results mean the SPD, which has been the junior partner in the "grand coalition" for the past four years, will be ejected from government. The SPD's candidate for chancellor, Frank-Walter Steinmeier, said his party would be "vigilant in opposition". And he added that it "would not be very sensible" to resign, vowing "to go on fighting". Several world leaders have congratulated Mrs Merkel on her victory. US President Barack Obama told her that under a "strong German government" ties between the two countries would "further strengthen and deepen", the White House said.